" Once I bloomed, to be with you. Today I am an elapsed reminiscence. Day by day, I am fading away. i clicked these pics quite some time back. would love to read your "take" on the pics. thanks a lot for all your beautiful and interesting inferences on my previous poem. the lines are beautiful as always...!!! n the pics...i liked the second one..!!! it shows the life of an Indian who is working hard to live his day..!!! Very true about the poem, but there are some memories whatever life turn to be, the scar or healing forever reminiscence. woah all that is so beautiful!!!! loved the first pic.. have no clue how you think of those so appropriate words!! One of your best oeuvres till date and makes for a beautiful song for a Desolate soul. Beautifully written. :) Kudos. The pics again perfectly fits in the context here. You really are a good and innovative photographer. 1 thing - I did not like the change in font in the poem. The font should have remained the same throughout the poem. Also, the flower pic is excellent, but I feel something is missing thr. Not sure what that should be. and ur words are magnificent as usual. Simple shots conveying a deep meaning there. Good work!!! The lines, to me, seem like rising again from some downfall. once blooming -> then fading -> getting far away -> forever. Mind you, I infer that from both the snaps and lines. Came in here from Smiley Tissues. May you always be blessed with such creativity sweetheart. You've just been awarded!!! Congratulations!!! Visit my spot for the award!!! nice lines...I feel nice is too small a word to describe it....the second one of course!! i luv it! 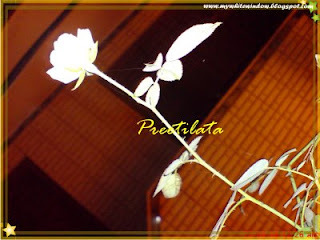 Wow Preetilata, I am struck by the creativity and beauty of your blog. My name is Amrita not Mel. Thank you for visiting my blog. i commented.. but it disappeared .. is there a comment deleting gang./? through a blog post or even through the cell..
And time rides on a snow white horse...nice on...keep walking!!! Note:: Last week we have had some problem with the server due to which we could not update news and articles on time. However, that problem has been resolved now. We appreciate your patience and support. infact i just read someone's blog where she wrote about things that are repeated..
A little different but the same i wud say..
hope to see u there..